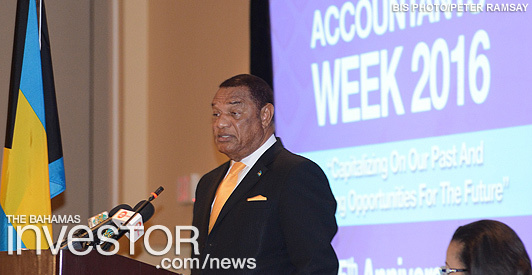 Prime Minister and Minister of Finance Perry Christie said that accountants are on the “front line” of The Bahamas’ business and commercial entities, as they are an integral part of the inner workings of the country’s firms and government enterprises. Prime Minister Christie made the statement during the opening ceremony for Accountants’ Week organised by the Bahamas Institute of Chartered Accountants (BICA), at Melia Nassau Beach Hotel, November 14, 2016. “In your professional capacity, you assist our firms to diagnose their challenges and, if we are wise as owners and managers, we listen to your advice on the ways to mend our businesses to become more successful or to make the requisite improvements,” he said. Prime Minister Christie pointed out that, in the Commonwealth of The Bahamas, the history of the accounting profession is a relatively new and remarkable one despite not always being heralded in the manner that was befitting such an important sector of the professional world. In its infancy, he added, the local profession was led by many well-known expatriate personalities who made positive contributions to the nation; but in the mid-1960s as young, educated Bahamians saw opportunities to advance, so came the advent of BICA in 1971. “There is no doubt that the birth of BICA in 1971 and the birth of an independent Bahamas in 1973 was fate in the making,” Prime Minister Christie said. Christie said that, likewise, The Bahamas continues to grow “from strength to strength”, and the paths of BICA and the wider Bahamas are to become even more entwined, as the nation moves “forward, upward, onward, together”. “Therefore, I take this opportunity to congratulate the Institute on its celebration of 45 years of existence and self-regulation, with a complementary theme of ‘Capitalising on Our Past and Building Opportunities for the Future’,” he said. Christie went further to say that if the economy of The Bahamas is to be successful then, the country needs to encourage the growth of a healthy and vigorous accounting profession. “We must ensure that those who are in the profession remain at the cutting edge of best international practice and well-trained and we must encourage the young bright minds of our country to continue to enter the profession,” he stated. In this regard, Prime Minister Christie said, all present at that time should have been aware, that the nation celebrated the birth of the University of The Bahamas a week earlier – a “proud occasion” for The Bahamas. He noted that a “key pillar” of the University’s academic strength is its Business School and Accounting programme. Prime Minister Christie said that The Bahamas has long been a country known to “punch far above its weight class”, and the local accounting profession is no different. Speaking at an event held in Nassau last week, Minister of Financial Services Hope Strachan spoke about efforts being made to shore-up the financial services industry in the face of increased global compliance regulation. Watch a ZNS Network news report here. On November 16, 2016 The Islands of The Bahamas will strengthen its position as the leading destination for weddings and honeymoons when it hosts its third Sixteen Weddings Invitation.